The Octozoid is ancient yet strong...an engine of wrath. But I fought in the Galactic Wars! I flew in the acid blizzards of Wandrafel! I burned the sky industries of the Jehenna! I fought...I survived! And I will not...be defeated...NOW! Cosmozoid, known as Pegasuros in Japan, is a step up from everyone's favorite kamikaze rolling duck, Glidoler/Terrazoid—the Blade Liger to its Shield Liger, if you will. And it's pretty darn cool. 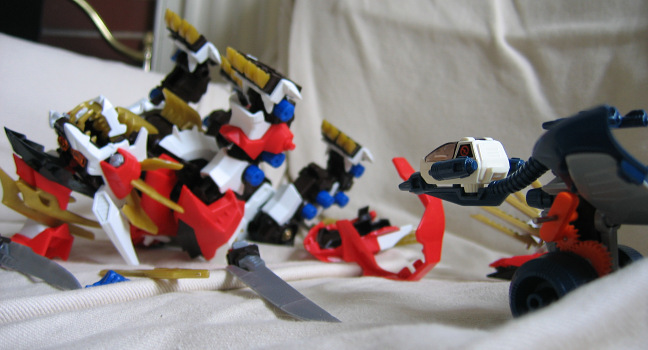 While the battle story had Pegasuros as capable dogfighters early on but showed them very little after that, the UK comic (starting later into the toyline) portrayed them as obsolete but had them show up a lot. I wonder if someone liked drawing them. Krark saw them worthy of inclusion in his plans despite their age, taking in an abandoned group of Cosmozoids as his army's first recruits. A stray one going down near the Celeste (and fever-induced flashbacks) led to Rolo remembering finding one in an alien tomb in his younger days, proving the Cosmozoids of old nearly reached Earth. And then there was the trippy story in which Zee and Zed the battle-weary Cosmozoids sought Metalon, Zoidstar's equivalent of heaven...or perhaps hell. Anyway! 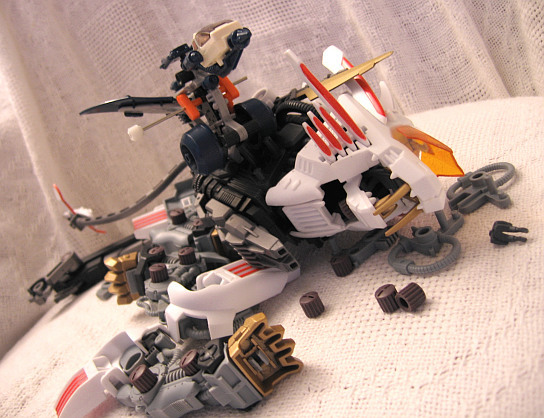 As is typical of the really early Zoids, Cosmozoid is amazingly simple for what it does: it uses two frames of parts, a motor (one separate gear included), and a head. That's it. They're two little frames of parts, at that, and this guy's pretty decent-sized for its time. 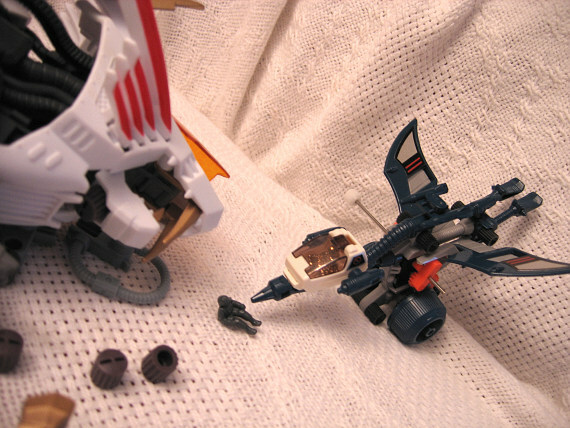 It's small now, sure, but remember it was designed when Big Stompy Doom was Bigasaur/Zrk and Mammoth. It and Glidoler use the same motor, body, and wings, but manage to look quite different and unique: Cosmozoid keeps the wheels but drops the charming (and rather silly) duckwalk, gaining a long neck and bigger, flappier wings as its main motorized attraction. Stats-wise, this makes for a much higher max speed. 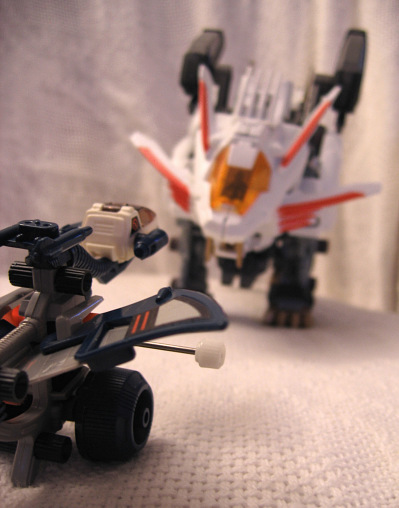 In fact, Cosmozoid is one of the fastest flying Zoids, reaching Mach 3.4 in a pinch thanks to emergency boosters. The wings are the coolest part of the upgrade, in my opinion: Glidoler has short stubby ones, so what's the best way to get longer wings for our Cosmozoid friend? Mold new...wait, clip longer ones on? 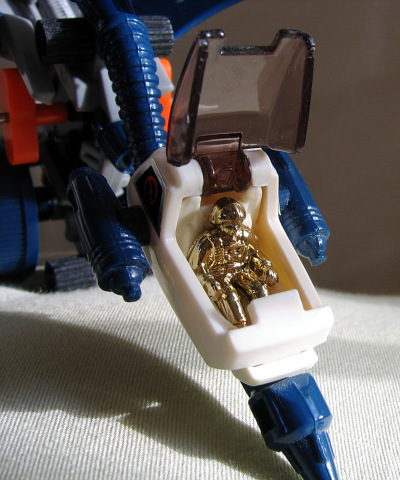 That's right, there's no bits left over—no missile pods, tail, shield flap, and guns, none. Instead you get this cool layered effect and wings that still flap quite nicely. And they have shiny stickers. You have to love the shiny stickers. I rarely use stickers and I used them! In motion, Cosmozoid rolls merrily along, wings flapping. It doesn't chomp its jaws because it has none. There's not much else to say, other than it looks darn silly trying to scoot along on my keyboard—and if you like old windups, you totally need one of these.